Category: Promotional Products. Sub Category: Keyrings. Features: Metal keyring with black gift box.Print Area: Decoration option: Pad print, Laser engrave. Print & Laser Engraving Area: Front 22mm x 18 mm, Rear 25mm x 20 mmCarton Size(CM): 35x28x28Carton Weight(KG): 11Carton Quantity: 250. Colours: Silver. Category: Promotional Products. Sub Category: Keyrings. Features: Leather keyring with black gift box.Print Area: Decoration option: Pad print. Print Area: Front 16mm x 12 mmCarton Size(CM): 35x28x28Carton Weight(KG): 8Carton Quantity: 250. Colours: Black, Brown. ABS. -Black case with solid perfume. -Attach to air vent and rotate 360 degree. -100pcs per inner box. . COVER, BLACK. Product Size: 5.1x4cm. Epoxy doming 4.3cm D.
Terylene/Cotton cloth. UV protection sun shades with 2 suction cups. Folded into the pouch with drawstring closure. Silver, Cover, Imprint size. Product Size: 17x8cm(Closed); 200x70cm(Open). Print. ABS. Safety design carton opener with key ring. Push the red button to use. Easy for using and carrying. White, Cover, Size. Product Size: 7x3x0.7cm. Print. 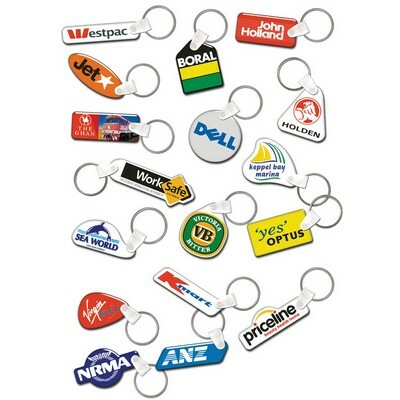 These lightweight, durable and flexible key tags have a great “hand feel” and feature full colour vibrant imprints. Design your own custom shape at no extra charge. Description: Perfect tradesman''s accessory. Hard hat shaped white plastic keyring with bottle opener function. Features: Packaging: Polybag. Colour: White. Material: Plastic hard hat and metal bottom Product Size: 31mm(h) x 47mm(w) x 62mm(d) - Helmet only. Freight details : 500 per carton, 16.8kgs, 39 x 25 x 60cms; Decoration Type(s): Colour Print / Full Colour Print . Decoration Area: Pad - On Side: 17mm(w) x 10mm(h) or On Front: 20mm(w) x 13mm(h). Custom Metal Keyring. Product Id: K628. Custom Metal Keyring. Colours. Silver, Gold. Picto Photo Etched with Epoxy. Product Id: K640. Picto Photo etched with epoxy. Colours. Silver, Gold.